Massive disruption ahead. We live in a competitive world and it’s about to get even more intense. Can you count to infinity and beyond? Leave behind all myths and preconceptions. The education system can’t stay the way it is much longer. Taking away some minor improvements, classroom technology still looks the same way as it did 20 or 30 years ago. It’s a controversial subject but trends like these can’t be ignored. As learning tools are shifting from printed materials to digital media, the learning experience is getting more dynamic. There has already been more change in the last 10 years than in the last 1000 years, and the trend is only accelerating. Adopting advanced technology in the education system basically means that a vast amount of new information will be available. There are certain fears that this data could dehumanize people, whether students or teachers, ultimately making obsolete all human interaction. But EdTech, if anything, looks more for integration between students, teachers and parents; it will never replace personal relationships, experiences or culture. The data generated by these new technologies could enhance the studying experience in a way never seen before. Teachers, students and/or parents could track – in and out of school – progress and activities, directly addressing the areas that need to be developed. Increasingly detailed information makes for a deeper and more precise understanding of what students really need. This is exciting for everyone; we could be at the beginning of an educational paradigm shift. 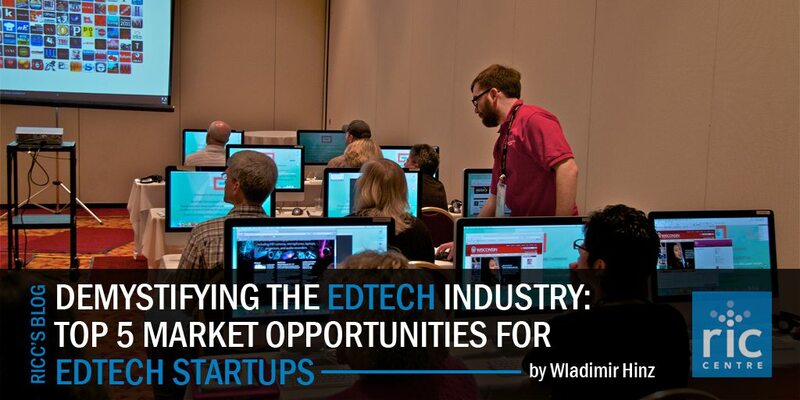 For Startups, in particular, investing in EdTech has never been better. Especially when you take a – rather deep – look at the numbers. The education industry is huge. It has a market size of around $4-5 trillion dollars globally. This is mainly because the concept of ‘education industry’ is very broad. It covers numerous areas that have quite different approaches to teaching, and this is not just referring to the methods that are used, but on the intended audiences and the goals students are expected to reach. It does, however, make for an interesting, diverse and gigantic, pool of companies. When one scrutinizes the numbers, it doesn’t seem like an exciting industry, as most of the funding goes into well-established companies with 10+ years in the market. However, there’s intense activity for companies raising Seed or Series A funding. Even though the global total funding raised by EdTech startups was $2.34 Billion in 2014 –not too impressive –, compared to 2013 the number is up 43% and it has been rising rapidly for the last 5 years. The same is true for the number of closed deals. The amount of global funding is comparably low just because the amount of funding for each startup is usually around the $ 1 – 10 million range. This may be due to the risk investors perceive from all the intense competition that’s driving the industry. Remote interaction: Online distance learning is the biggest trend. Learning management systems (LMSs) have been around for some time, but they were very complicated and difficult to navigate, now there are easier to use platforms that allow for interaction between everyone involved. Platforms like Blackboard are an example of this. Massive Open Online Courses (MOOCs) have been popular as well. Although their business model is still not the most effective, is fair to say that customizable formats are getting more popular and are slowly taking over. Companies like Coursera, Creative Live and Lynda.com, are just a sample of successful enterprises in online courses. Measuring progress: Expect to see developments in the ways individual progress is identified. As remote learning becomes more common, assessing skills and competences will have to be more precise if companies want to survive. In the end, students are looking for ROI, so effectively measuring and tracking the learning experience provides them with useful feedback about what they have learned. Under this category we find technology like the ones used by SmartererNanodegrees and General Assembly for its microcredentials. Wearables: Although in the short term we might only see smart watches being used in classrooms, there’s plenty of potential for wearables, especially for augmented/virtual reality devices. In a couple of years, when wearables become more affordable, they could be considered another tool for learning, particularly for hands-on active learning, much like smart phones. A couple of examples of what’s possible include devices like Autographer helping students with their note taking, Keyglove which is a fantastic tool useful in many fields like design, music and gaming, and, Muse that tracks brain activity and provides analytics. Blended and Flipped-learning: Although these are not new technologies, expect to see much more of them in future years. Expanding education to digital and online offerings will surely alleviate many of the problems that education systems have today, not only in costs, but in the quality of available resources. It’s also a way of engaging students outside of classrooms. This technology seems to be entering the mainstream this year. Anticipate online tools and video streaming that optimize interactivity and have plenty of powerful analytics to measure student progress in a personalized way. Khan Academy and Blended Labs are great cases of this. Technology opens up new possibilities for learning, for teaching and for effectively measuring skills and competences. Being able to address struggling areas at the individual level with customizable tools is crucial for the future. But as the industry begins to embrace the power of EdTech, it’s important to notice that these tools will only be secondary to what students are looking to learn. The success of the learning experience will still rely on skilled teachers. No matter what, the human factor is still a key factor.